Sounds like trigger is not your problem if RPM is being displayed. Have you tried bumping master fuel up & down? To check igniton timing with COP you use an HT lead between coil and plug and attach a timing light in the normal way. You can get special test leads for that purpose but usually just an old lead with its end cut off and poked up the bottom of the coil will do. Oh so you feel it may just be a timing issue. Or maybe not enough fuel. Thanks for the input I'll have another go tomorrow. 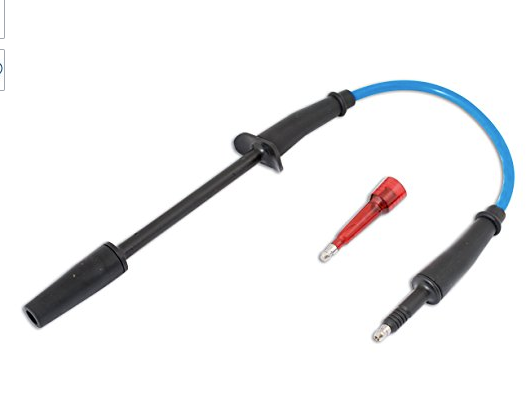 You need to make/buy a test lead like AdamW has said, connect it between the coilpack and the spark plug for cylinder 1, then go to the calibrate timing screen where you earlier said you set the timing to 4 or 234. I'm sure there are more detailed instructions in a section of the help file, but you need to then get a timing light connected to this test lead, and then disable fuel (injection mode off, or pull the fuse for you fuel pump). Find in the service manual(or google) what angle the timing marks are on your crank, set the "set base timing to" number in the calibration screen to match the value of your timing marks, then start cranking. adjust the trigger angle number until the timing light matches the timing marks on the crank (and remember to press enter after you type a number in). Once you have this set (and the delay to a sensible default, maybe 50ms), then re-enable fueling, save your config, and try to start it again. 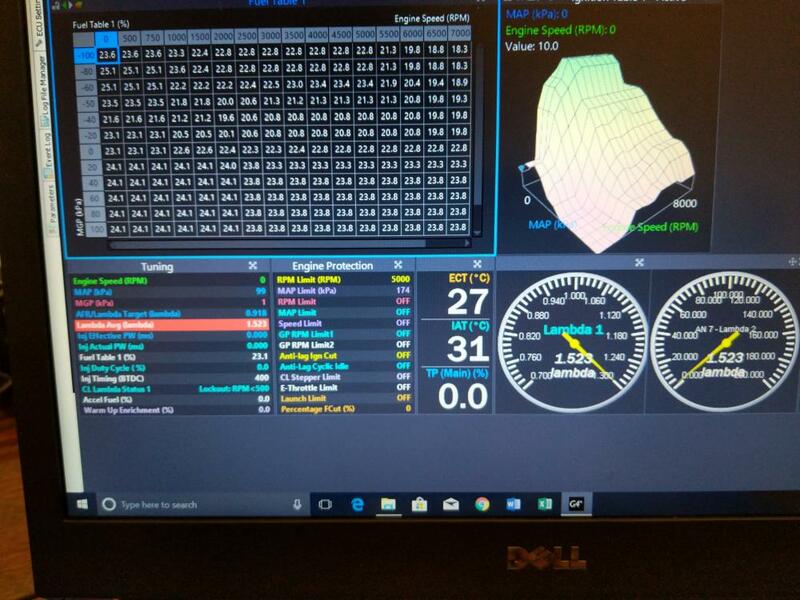 Once its running and youve got fuel rough enough, go back to the calibtration screen and give it some revs and check if the timing appears to drift at mid-high revs. Do not change your trigger angle, but adjust the delay until the rpm based drift goes away. So just had a quick look at the tuning page and noticed that the lambda AVG is red.? It's not plugged into the car ATM but is that a possible cause to look at tonight when I do the timing. Also I am using 315cc 7mge Injectiors and don't know if the fuel map I have is adequate? I also don't know what the values are. If I need more fuel do I select the whole table and bump it up 10 each time to see if that is a cause? Or is 10 to much. The lambda avg parameter is not relevant as the engine was not running when that screenshot was taken. To adjust overall fuel your best bet is to bump the master fuel number up or down. 1, note you can bump it up or down using your keyboard keys "Q" and "A"
Ok at car now car timing is flashing at 10 deg should I bump up fuel? probably somewhere in the region of 15 +/- 5 given the fuel table numbers you posted above. have a look at some of the base maps to get an idea what most traditional mode fuel tables look like too. 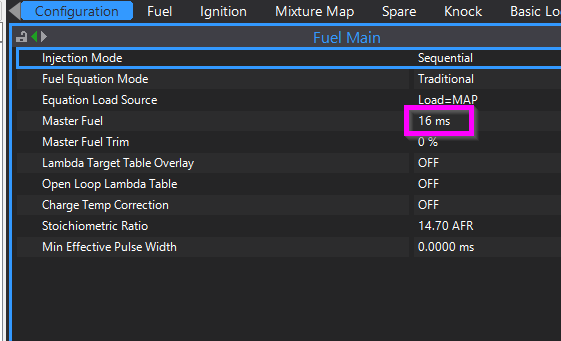 You will still be able to find a master fuel number that lets it start, but your table looks very flat compared to most of them so it may lean out quite badly at anything above idle. Getting that wideband connected will really help you see whats going on once its started. I notice you have ECU hold power and an ignition switch DI set up. 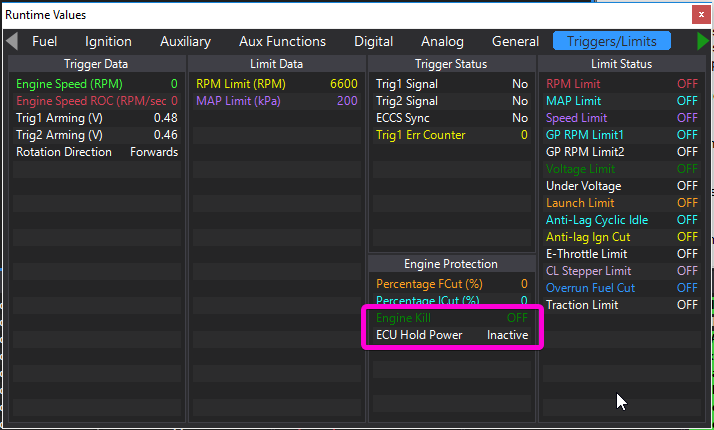 Check in the runtimes that "engine kill" is off and ECU Hold power is inactive. Currently, your trigger offset is -5. Just in case you are firing on the wrong TDC, you should also try +355deg. Ok I'll be back at my car in like half a hr I'll try 355 deg and the ecu hold power setting and get back to you. What is this trigger err? That trigger is now red with 3 counts? I won't try anymore tonight incase I stuff something up. Do you guys think the cas is faulty? Way back at the start you said you have a NON vvti 1uz right? your trigger pattern is set to "1uzfe", but looking at the help file this is only for VVTI models. 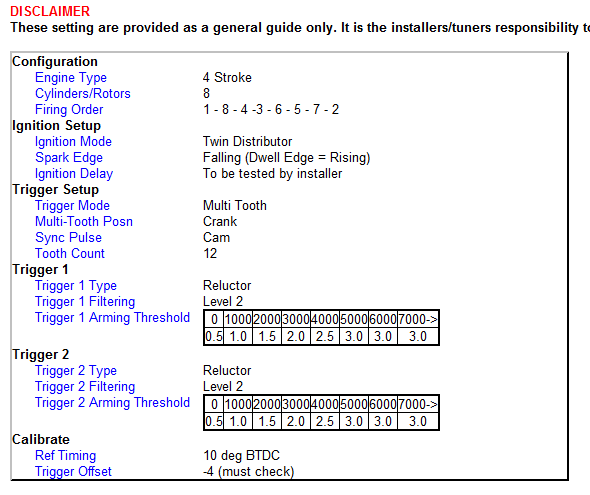 The 1uz (non vvti) should be set as below - note the multi tooth mode rather than 1uzfe. They reckon the trigger offset should be -4 rather than the -5 you are seeing too. 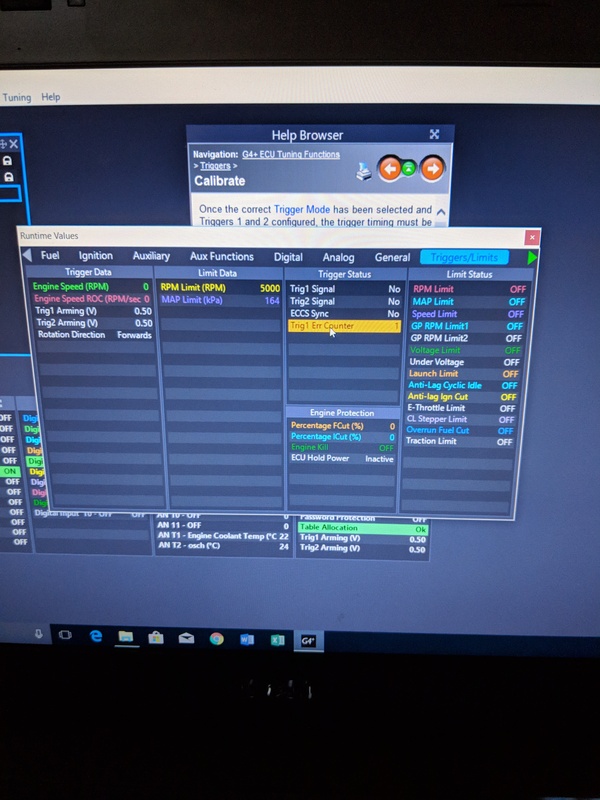 Its really close so will fire up regardless, but set the triggers as below and re-run the timing check while being really careful to check if -4 or -5 looks closer to the line. Do you maybe think the cam angle needs setting up? Lets try a triggerscope while cranking so we can confirm what you have. Here is a video how to do that: https://1drv.ms/v/s!AiYbYlZQuRHPmieMTkwQDCXEb2LY Attach the scope file here. Ok, so the settings that CJ has attached about 3 posts up would be what you need. However, your crank sensor is putting out very low voltage (or your engine is cranking slow) so you will need to lower your trig 1 arming thresholds. Or do I change that to the same values you just gave me for the crank trigger 1? Nah, your trig 2 settings are fine as is.